A fake BP Twitter account tweeting its “public relations” response to the oil spill now has five times more followers than the official BP Twitter feed, and it continues to grow. Just today, @BPGlobalPR passed the 25,000-follower mark, compared to the less than the 5,000 accumulated by the real account @BP_America. But according to AdAge, BP officials are aware of the account, and so far have seen it as people’s right to express their opinions. Twitter is unlikely to take the account down without an objection from BP. The account began on May 19 with this tweet: “We regretfully admit that something has happened off of the Gulf Coast. More to come.” It has enjoyed a boost in attention due to hundreds of retweets, including from celebrities. Update 4 p.m. PDT: Wired magazine writer Mat Honan outed Mike Monteiro as the author of @BP_America on Wednesday, which Monteiro initially denied via Twitter until he obliquely admitted it later in the day with an “I give up.” The headline of this story has been changed to reflect the update. Along the beleaguered Gulf Coast, the emergency measure known as “top kill” appears to have halted the flow of oil from a ruptured offshore BP well–but the bogus Twitter sensation known as @BPGlobalPR continues to gush out black comedy gold. “Just got the concession call from Exxon Valdez. They were great competitors and remarkably evil about everything,” the account, which claims to be written by the British oil giant’s public relations department, tweeted shortly after the unfortunate revelation that the recent Gulf Coast disaster had surpassed the 1989 Exxon Valdez oil spill in volume. “They want to fine us $4,300 for every barrel of oil spilled? Umm, we’re not spilling barrels, the oil is going directly into the gulf. DUH,” @BPGlobalPR asserted irreverently on Wednesday. I might add a few more. A lot of people are asking if we could have prevented this mess. Honestly, we have no clue. Our hindsight is 20/80. Lots of people blaming this on Bush or Obama. Pph, we wish. The truth is Presidents don’t have any control over what we do. Just saw new satellite images of the spill. Actually, it kinda looks like the Earth has a beauty mark! Ooolala! Please help us with rebranding. We’re not calling it an “oil spill” anymore, now it’s a “Southern Fun Party”. What is really hard to understand is why BP, with its well-paid crisis PR team working round-the-clock, is allowing someone to completely hijack its message so thoroughly. What could it have done better? Well, for starters, it could have had its Twitter accounts “verified” so the public would know at least that its own tweets are legit and that others are not to be trusted. 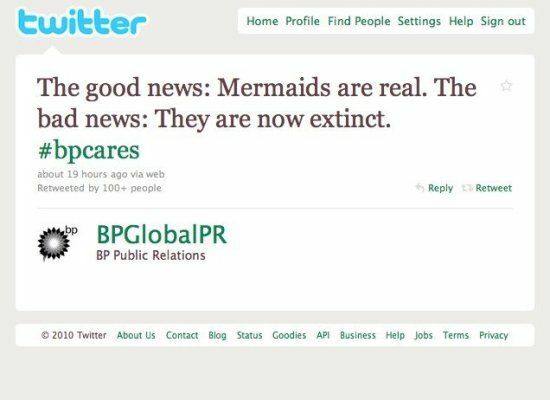 And BP has done nothing that we can see to distance itself from the fake tweeter. Not a single alert to say don’t trust the person behind the @BPGlobalPR curtain. Maybe BP really doesn’t care. Do, because fake BP Twitter is amusing. But what’s not amusing is that the leak is still going, and that no one seems to have more than the barest of inklings of how to actually fix it. (By the way, that hair boom thing didn’t work.) Oh, yeah, and BP has continued spraying the hilariously named but rather toxic chemical dispersant “Corexit” into the Gulf despite the EPA’s demand that they use something less toxic. It must be more than a little crazy-making to watch people make mean jokes about your nonexistent attempt to quash a source of mean jokes about you. But BP is making the right call by not making a big deal of the parody. Social media networks are the adult playgrounds of the 21st century — better to let the masses let off steam there than, oh, filing class action suits, or chaining themselves to dead pelicans. Besides, the company obviously has more important things to focus on at the moment — the latest news from the New York Times suggests that the “top kill” effort to plug the leak isn’t working quite as well as some reports indicated earlier Thursday. With each day that the leak continues, frustration swells, from the White House on down to the Twitter masses. But on Twitter, at least, there is some humor to be found, even if most of it is the same color as the oil.